Recently, I secured my first major production shoot for a client (does that mean I'm no longer a filmmaking amateur!?). It's a non-profit organization so budget is a big factor which is why I will going it alone as a one-man-band. In preparation for this week-long shoot, I asked a friend to help me do some practice with lighting. Most, OK all, of my videos over the last year used natural light. There were times when I wish I had lights, but I typically don't work like that. It's run and gun for me. But this video is going to be used for several years and some pretty important people are going to be interviewed. So, I want to make sure that my bases are covered in the event that I find myself in an office environment with terrible lighting. This practice session also gave me the chance to dig deeper into the menu of my Panasonic DVX 100A. I've used this camera off and on over the past year. 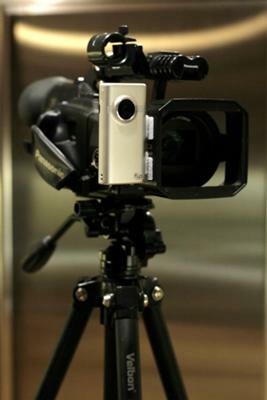 I've also been using a Flip Mino HD pocket video camera. I performed some video tests between the two cameras and the Flip brings in better video than the much more expensive Panasonic under the right conditions. But the Flip doesn't compare to the Panasonic in the audio category. Being able to use a Mic or Line input is a must when doing interviews. So, to cover my but, I've created a unique shooting situation that allows me to shoot with both cameras at the same time. I applied some Velcro to the lens cover of the Panasonic and to the Flip. With this set up, I can record with both cameras at the same time with just one tripod. this shoot so I want to make sure that I am able to quickly get in and out. Over the past few days I've learned a lot about both cameras. Having a willing subject that was willing to be interviewed over and over again gave me the chance to see how the Flip and Panasonic looked under lights, in low light and in outdoor lighting situations. The added benefit of the practice sessions also allowed me to learn how to better set up my Panasonic in different lighting situations. Something I had been needing to do but never took the time to do. I feel much better now that I have run my set up through a variety of shooting scenarios. Whether I am confronted with natural light or if I need to use my studio lights, I know that I know what I am doing which will put me at ease as I am setting up for interviews. Not to mention that I will be able to focus more on my interview subject and not be distracted by a nagging in my head that keeps wondering if I have my technical stuff taken care of. Being a one-man-band can be hard. You've got to be a producer, director, cinematographer, sound engineer, journalist and an overall nice guy throughout it all. People get better at anything with practice. I'm glad I was able to get some practice in before this shoot. If you've got a friend that is willing interview them. Run yourself through the paces. Put yourself in bad situations just to see if you can get out. It's much better to screw up with your friend than with a paying client. Have you created a unique work-around to solve your technical or equipment shortcomings? If so, I'd love to see how you solved your problem. In so doing, you may help me avoid a future problem that I'm not even seeing. Leave comments below. Thanks!